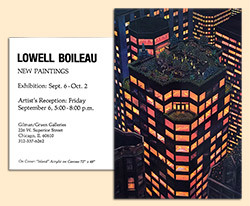 Detroit artist Lowell Boileau is a self-learned painter and internet media artist. "BIG Highland Park Art Show" - Group Exhibition - 333 Midland & Annex Gallery -July 27/28/29 2018. The Website as Art. 1996 to Present. 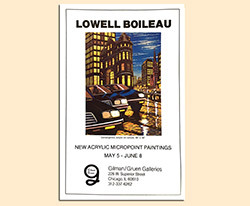 Lowell Boileau demonstrates "Total Intervention"
"Best Detroit Artists to Collect"
He has been recognized as one of the "Best Detroit Artists to Collect" - Hour Magazine 2007 and one of Detroit’s Emerging and Established Artists” - Crain’s Detroit Business 2007. His DetroitYES.com been cited as best Detroit website by Detroit MetroTimes, Detroit Free Press and Hour Magazine. 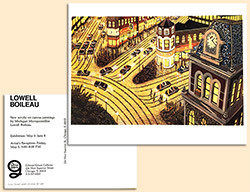 A three-time Michigan Creative Artist Grant recipient, awarded the Arts Midwest NEA Grant for painting and the Arts America Grant, Boileau has been profiled and reviewed in WIRED, New York Times, Detroit Free Press, Detroit News, Detroit Metro Times, Stuttgarter Zeitung and Stuttgarter Nachtrichten. 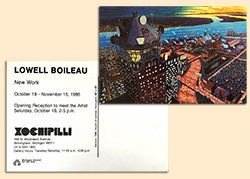 He was a co-subject of the 1983 Urban Communications of Detroit documentary Waterworks on his co-created Micropointillist painting technique and a feature figure in the 2008 BBC Documentary “Requiem for Detroit” 2010. 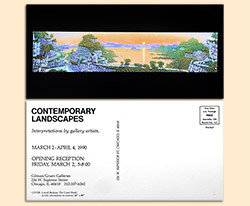 His paintings have been displayed in exhibitions in the United States and Europe. He has been a guest lecturer at the University of Michigan, Burg Giebichenstein - University of Art and Design in Halle, Germany, Wayne State University, and Youngstown State University. 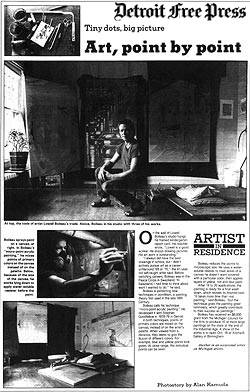 He was a guest artist at the international art colony of Schloss Solitude in Stuttgart, Germany. 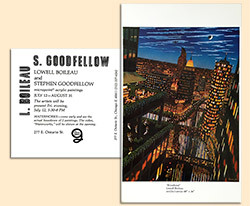 He developed the novel Primary Color Micropointillist painting technique along with fellow artist Stephen Goodfellow that results in uniquely luminescent and richly colorful paintings by using only the three primary colors of yellow, red and blue. 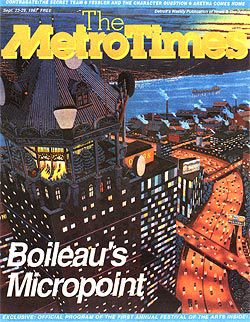 Both artists are the subject of the 1983 documentary on the micropointillism painting technique, Waterworks, produced by Urban Communications of Detroit. 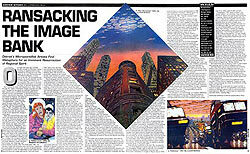 He paints, he clicks, taps and swipes. 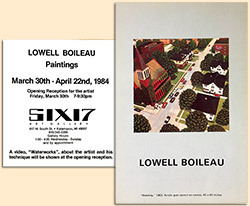 With the arrival of the World Wide Web in 1993, Boileau discovered a new medium for expanding and expressing his Detroit urban landscape painting interest. 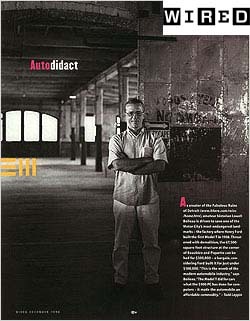 He created the first Detroit online fine art gallery in 1994. Quickly recognizing the immense aesthetic expression potential of the internet, he began creating interactive website art projects. 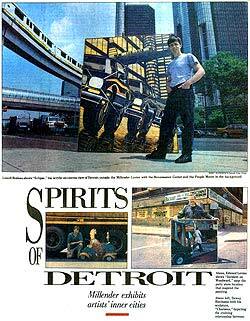 Among those works was the widely recognized “The Fabulous Ruins of Detroit”, now known as the DetroitYES Project. 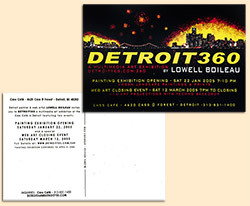 Ongoing since 1997, the DetroitYES Project [DetroitYES.com] is inspired by the troubled transformation of Detroit from Industrial to Information Age city. 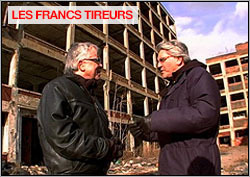 In 1999 DetroitYES began hosting the internet's most renowned and sincere discussion forum focused solely on Detroit and its challenges, the Discuss Detroit Forum. DetroitYES has been honored as a Yahoo Pick of the Year, twice selected as Detroit MetroTimes Reader’s Choice as Best Detroit Website, chosen as a Detroit Free Press Best Website and profiled in many media sources including The New York Times, PBS TV, and Wired magazine. 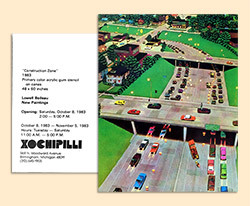 DetroitYES.com attracts over 4 million visitor sessions per year that pore through its thousands of photographs and pages. 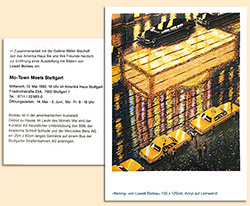 Other web art creations by Lowell Boileau include Soulful Detroit [SoulfulDetroit.com] and The Lost Synagogues of Detroit [Shtetlhood.com]. 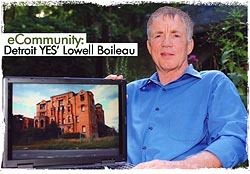 A Michigan native, Boileau earned BA in Political Science from Taylor University in 1967 after which he served two years teaching at Salesian High School in Manzini, Swaziland as a U.S. Peace Corps volunteer. 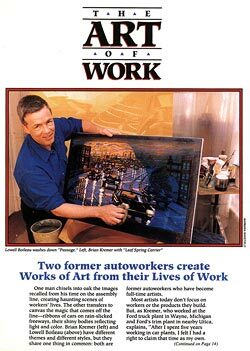 He engaged in post-graduate studies at the University of Michigan and Wayne State University in intellectual history and political theory before deciding in 1972 to pursue a career as a fine artist. His travels as a painter have taken him throughout Mexico, Europe, Africa, and the Middle East. He works out of his studios in Detroit and Farmington, Michigan.